This app features the official remake of the highly popular arcade game that was developed by Konami and released in 1981. You can play the online flash version and read more about the original game on the Frogger page. If you've never played before then you'll need to know that the idea of the game is to guide your frogs to their homes at the top of the screen across a busy road and river. You need to avoid the vehicles on the road (these become progressively faster with each new level) and then jump on the logs and turtles at the right moment to make it safely across the river. The official, free android version looks and plays very much like the game I played on my Atari 800XL (which came on a ROM cartridge) back in the mid 80s. However, for some reason the size of the game appears to be a lot smaller than the actual screen size on both a tablet and phone. It's just about big enough on my 7" tablet, but you do struggle to see the game on anything smaller. Why the game doesn't fill the entire screen is beyond me. What I do like is the choice of controls. Joystick mode is my favourite which shows a mini joystick at the bottom of the screen which you simply tap to move your frog in the right direction. As the name suggests, slide mode involves sliding your finger over the frog in the direction you want it to go. In tap mode you tap the area of the screen corresponding to which direction you wish to move, although I found this rather difficult to get my head around. You can also play the game in phantom mode which displays a ghost version of your frog which moves as you did in the game where you achieved the highest score. This is pretty handy and reminds you how you played to achieve your high score. 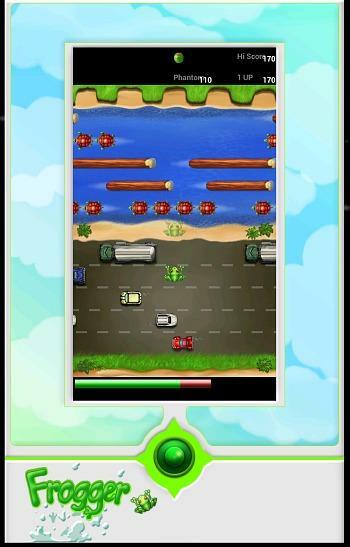 Overall, this is the most authentic version of Frogger for android and is very playable. Your frog is very responsive and the game certainly reminds me of the happy times I spent in my teen years playing on my Atari back in the 1980s - well worth the 0.63p asking price! However, if your device has a screen smaller than 7" then you may want to avoid the game due to its small size.